Does Rubbing Help a Cat With a Furball? Hairballs are a byproduct of your kitty's grooming procedure. Hairballs. They're among the least dignified aspects of the average august feline. Rubbing your kitty -- such as massaging or just petting -- won't help your cat eject a furball. However, "rubbing" your cat to remove loose hairs is a worthwhile means of limiting if not preventing hairballs. Your kitty is fastidious about grooming and cleanliness. This aspect of feline self-sufficiency has an unfortunate side effect. As your furry friend licks herself clean, she swallows the loose hairs that get caught on her spiky tongue. Ideally, these hairs pass through the stomach and intestines to be eliminated in bowel movements; sometimes, however, they don't pass through. Fur can get tangled together and accumulate in your cat's stomach, forming hairballs. Such masses don't pass into the intestines to be expelled with stool, so your kitty has to vomit them up to be rid of them. The vomiting generally begins with dry-heaving and hacking sounds that eject a wet, elongated mass of hair with little or no actual vomit. The gagging and the resulting wad of hair distinguish "hacking up a hairball" from other types of vomiting. 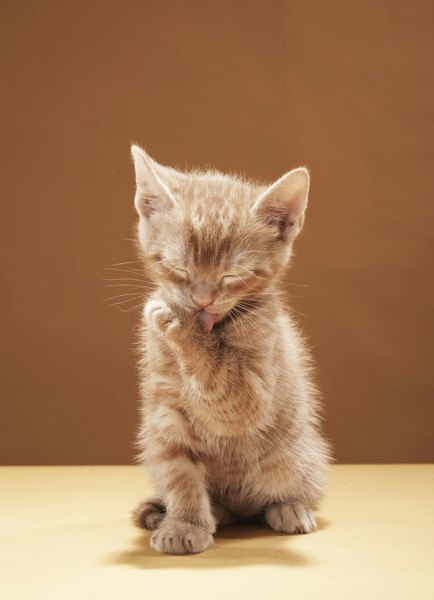 Consistent hand-grooming helps prevent hairballs. Rubbing, per se, isn't an effective way of reducing loose hair; combing and brushing are, though. Use a feline grooming comb or brush. Some products are designed for short- or long-hair cats, so check the label. Cat-grooming gloves with small teeth or bristles strip away loose hairs while you pet your pet. Slide the glove on your hand and pet your cat with long, smooth strokes. Remove and discard wads of hair as they accumulate. Also, talk to your vet about furball prevention if your kitty gets a hairball more than once every week or two. Specially formulated high-fiber pet foods help your cat pass hairballs with stool, and laxatives and lubricants are sometimes used. If your cat seems to groom excessively, she may need more mental stimulation. Get her a new toy or two and play with her more. Dangling strings, shining a laser pointer around the room and other play stave off your kitty's boredom and give her an outlet for pent-up energy. There are only three ways for hairballs to get out of your kitty: Via stool, vomit or surgical removal. Rubbing or massaging your cat anywhere will do nothing to move along a furball lodged in your cat's esophagus, stomach or intestines. You may even hurt your pet attempting to rub out a hairball, so don't try. Normally, your kitty can take care of the problem on her own, so when you see her retching or hacking, expect vomit to be forthcoming. If your kitty doesn't expel a furball, treatment is required. Ask your vet about using a lubricating product or a laxative to help your kitty pass the furball. A lubricant will help a hairball move through the digestive tract. In rare instances, furballs that don't pass all the way through the intestines to be expelled with stool require surgical removal. Should I Be Concerned About Helping My Cat With a Furball? You're right to be mindful of the furball situation in your home. While hairballs aren't usually a problem -- except, of course, when you're on cleanup duty -- they can threaten your kitty's health and even her life. A hairball stuck in your cat's intestine creates a potentially fatal obstruction that hinders the digestive process. Watch for signs your cat may have an intestinal obstruction, and get her to the vet right away if you notice any. Repeated unproductive retching or gagging as if to vomit is a sign a hairball may be stuck. Your kitty may lose her appetite, become lethargic or develop constipation or diarrhea. Do Cats Vomit White Liquid Because of Hairballs? Can You Put Vaseline on a Cat's Nose for Hairballs?